Comet Siding Spring came close enough to Mars that its visible coma barely brushed the planet. This is the closest comet encounter with either Earth or Mars ever observed. Several spacecraft in orbit around Mars observed the comet flyby. The High Resolution Imaging Science Experiment (HiRISE) camera on Mars Reconnaissance Orbiter acquired images of this comet from a minimum distance of about 138,000 kilometers, yielding a scale of about 150 meters per pixel. Telescopic observers had modeled the size of the nucleus as about one kilometer wide. However, the best HiRISE images show only two to three pixels across the brightest feature, probably the nucleus, suggesting a size less than half that estimate. [Morrison note: The bright feature in these images is probably the jets and might be considerably smaller than the dark nucleus, since we know from other comets like Halley that the jets often arise in just a part of the nucleus]. Here is a composite HST image of the comet as it passed Mars on October 19. The Perfume of a Comet: How does a Comet Smell? 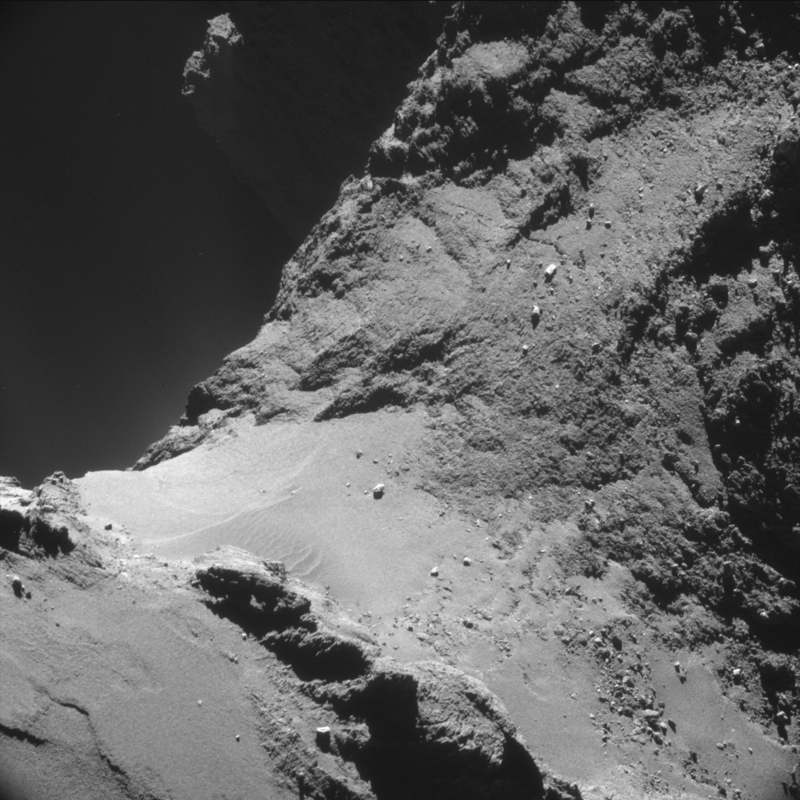 Since early August the Rosetta Orbiter Spectrometer for Ion and Neutral Analysis (ROSINA) is sniffing the fumes of the comet Churyumov-Gerasimenko with its two mass spectrometers. The detected chemistry in the coma of the comet is surprisingly rich already at more than 400 million kilometers from the Sun. The perfume of this comet is quite strong, with the odor of rotten eggs (hydrogen sulphide), of horse stable (ammonia) and the pungent, suffocating odor of formaldehyde. This is mixed with the faint, bitter, almond-like aroma of hydrogen cyanide. Add some whiff of alcohol (methanol) to this mixture paired with the vinegar-like aroma of sulphur dioxide and a hint of the sweet aromatic scent of carbon disulphide and you arrive at the perfume of our comet. While this doesn’t probably make a very attractive perfume, remember that the density of these molecules is still very low and that the main part of the coma is made up of sparkling water (water and carbon dioxide molecules) mixed with carbon monoxide. “This all makes a scientifically enormously interesting mixture in order to study the origin of our solar system material, the formation of our Earth and the origin of life,” says Kathrin Altwegg from the Center of Space and Habitability (CSH) of the University of Bern. 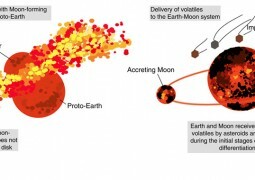 NUKES FOR DEFENSE AGAINST ASTEROIDS? Russia. That object (estimated to be nearly 20 meters in size and carrying a force of more than 400,000 tons of TNT) injured several hundred people, mostly as a result of flying window glass and other debris. NASA estimates that more than 100 tons worth of tiny space debris hits Earth daily, much of it burning up in the atmosphere. “Any time you talk about nuclear weapons, it’s controversial,” said NASA’s Mr. Johnson. In an era when the size of the atomic-weapons stockpile has been shrinking as a result of arms-control treaties and other factors, asteroid defense “may be an excuse for keeping the nuclear arsenal together,” said Jay Melosh, a professor of earth, atmospheric and planetary sciences at Purdue University. But he thinks there are better, nonnuclear ways for defending the planet. Among possible options: a “gravity tractor” or an “impactor.” The former involves using the thrusters and the gravitational tug from the mass of a large space vehicle to change an asteroid’s course. The impactor, as its name suggests, would crash at high speed into the asteroid with the same purpose. However, some argue that such approaches would only work if the asteroid is small enough and seen soon enough. For larger objects and shorter response times, a nuclear explosion, because of the huge amount of energy it can deliver, “is the only option,” said Bong Wie, a professor and director of Iowa State University’s Asteroid Deflection Research Center.